September 10, 2012 By Joe | Heads up: Buying via our links may result in us getting a commission. Here's why. The MWC Bond Strap shown above was originally featured over here. See the comments for some more than fair criticisms from the serious watch fans in the readership. The grey/black striped strap is sold out, but they do have a black strap version still available for $199. MWC’s Positives: It feels extremely solid. Has a nice weight to it. The rotating bezel moves with decisive snappy clicks. Screw down crown looks less like a watch crown post, and more like a piece of industrial piping. 200m water resistance. Movement is hackable and can be hand wound. Case & colors are sharp. Drawbacks: No word on where the movement (or the case) is made, so, probably China. When manipulating the crown it doesn’t feel flimsy or crunchy, but it’s not as smooth as a Swiss movement. Crystal is a hardended mineral instead of sapphire. No lume to speak of, so forget reading it in the dark. Some like the no-logo feature, but without one the dial looks a little… blank. Seiko’s Positives: The extra diameter makes this a welcome alternative to the Seiko SNK80 series . Those go for $60 – $80, but at 37mm in diameter, they can look awfully tiny on many a guy’s wrist. This model is 40mm. Exhibition caseback, nice looking dial with a day & date display, and a red tipped second hand. Good luminosity in low light. The matte stainless case and band buckle keep the flash to a minimum. Drawbacks: It’s pretty plane Jane. Strap it comes with looks like it came off an old Timex Camper watch. Can’t be hand wound. No rotating exterior or interior bezel to keep time with. The crown & post on the MWC. There’s the beef. The exhibition case-back and an ever dependable Seiko movement. I was surprised how much I liked the MWC out of the box (after the understandable criticisms over here) and conversely, how I didn’t like the Seiko quite as much as I thought I would. But that dial on the MWC just looks so vacant. And it’s $80 – $90 more than the Seiko. But the Seiko, and hooray for simplicity, is about as exciting as a Toyota Corolla. But y’know? They sell a lot of Corollas. Which would you pick? Meanwhile, got any other under-$200 black casual watch options? Leave em’ in the comments below. Difficulty: Try to keep suggestions to in stock (since this and this are both sold out) and sold by reputable sellers. What to wear the evening before the big day. He’s one of our own! Winter… be gone! Making the change for spring. From suits to shoes, watch straps to neckties. Plus BR Exclusion free, and it’s just about last call for the big Allen Edmonds Anniversary Sale. If you’re open to homages and Chinese movements, then a PAM homage from Getat is worth considering. Starts at ~$100 and pretty good considering the price. Agreed that the Seiko SNZG15 strap leaves much to be desired. They would have been better off with a generic NATO strap. 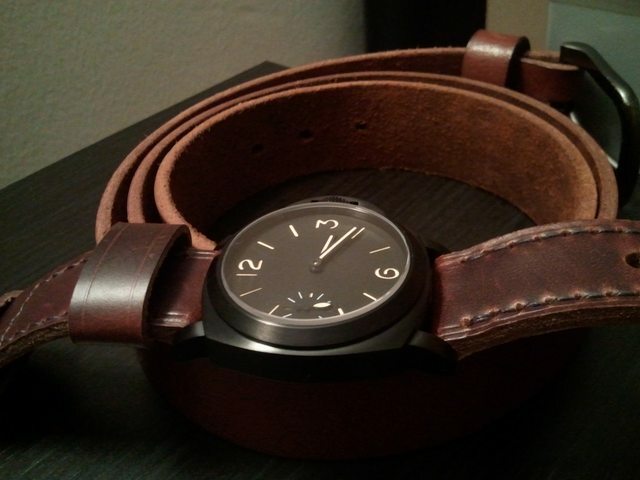 That being said, a strap change works wonders to elevate this watch’s style. Try it with a black or blue water resistant leather strap . MWC is doing the right thing not putting their name on it. It’s a wonderfully mashed up watch, calling inspiration from so many other divers, esp the SMP. Probably a better buy at half the price. I’d say just put the MWC strap with the Seiko and you’d be good to go! I’d skip them both and settle for something of a compromise. I’ve seen that one in person. Didn’t sit quite as naturally/flush on my wrist as either of these two. The 42mm wore a little smaller on me. You own one? Like it? No, I don’t actually, but I’ve been contemplating it for the last couple of months. There are some really nice Mods being done to it, that are an homage to the much more expensive Fifty Fathoms watches. Yugster had it on sale a week or two ago, for under $90…and I missed out on the sale unfortunately. 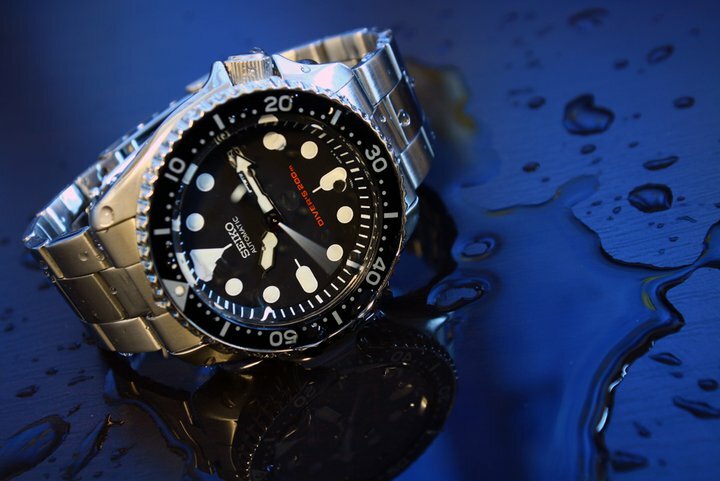 http://dappered.com/2011/06/in-person-the-seiko-5-snzj59-review/ ) Hard to go wrong with a Seiko 5 though. Can’t say I’m a fan of either (and I own 7 Seikos). For the money I’d rather have an Orient Mako (full disclosure I already have a black dialed Mako and an Orange dialed one). The Seiko is one of the plainer ones they make (as you noted), but the movement will be rock solid). I’m leery of the MWC because of the Chinese movement (they seem to be hit and miss) and the styling is also too plain for my taste. I will say this, due to our really solid relationship with Orient, I’ve been able to handle a good chunk of Makos. I get that it’s their flagship watch, it’s really nice and the specs are incredible for the price. I just like the way their Ray as well as this MWC looks/feels a lot better than the Mako. I’m somewhat if a purist. Not a fan of the MWC because of its obvious nod to Rolex. The Mako, or the Mako II? I like the first, but not the second. 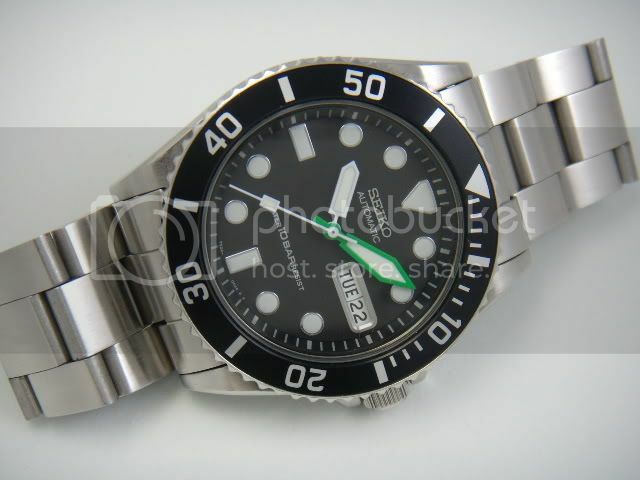 Correct model name is SKX007. Great watch. This is timely. I just took delivery of this Seiko’s brother, the SNZG13, this weekend. I am completely in love with it. A bit plain? 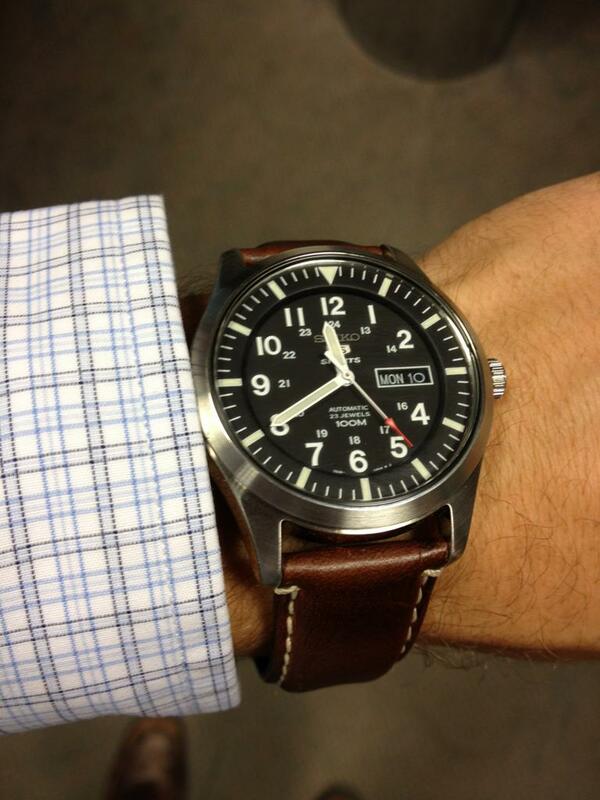 sure, but after swapping the bracelet for oil tanned leather, its my poor man’s Hamilton. I do plan on throwing it on a NATO from time to time as well. With the 13’s combination of brushed and polished case surfaces, it will stand out a bit more without being flashy. I notice the watches are on the larger size, 44m for the largest selection of watches. I have rather thin wrists but might be able to pull this off if they wear small. Any input on how they look on a smaller wrist? The MWC sub homage is just a Manbushijie sterile in a new box. It’s not waterproof in any way and def not worth $200. Go to manbushijie.com and search under no logo and you’ll find the very same watch for about $80. Ok at that price and people will comment as it looks like the Ginault BM-1 from a few feet away. “homage” lol. its a knockoff/fake. i’d take the seiko, no questions asked. knockoff/fake = slapping a brand name on an item and trying to pass it off as said brand name. The MWC looks great. I generally don’t care for large numbered rings, but it is striking the fancy I have for James Bond’s dive watches. thanks for the correction. Great thing about it is that its also one of the most modded watches out there and a true ISO diver. If you ever get bored of it, you can always find new bezels, faces, hands, and bands for them. If I remember, my wrist is something like 6.5″ in circumference. Mine is a 44mm and it fits just about right, with no overhang. They’re certainly chunky, especially with the thick leather straps, but they look good on the wrist. Don’t expect them to fit under proper fitting shirt cuffs though. The price of the Seiko makes him a good choice even though the “Corolla statement”. Nice price/quality ratio for a watch that cost less then one hundred bucks. Thanks. Exactly what I needed to know. Appreciate the response. Seiko by a mile! The MWC is a straight-up-faux-Submariner. Uber-classic design, but I wouldn’t want to be the guy wearing an assimilation of a watch I’ll never be able to afford. It’s not an overt projection, but I would be self-conscious about it! Seiko is tried-and-true, and they knock it out of the park design-wise here. Just sporty/dressy/casual enough, and taking cues from the Swiss without totally ripping them off. I’ve had my eye on that MWC for a minute. anyone read this article from four-pins? Apart from rings and necklaces, watches are the next timely piece of jewelry you can find in a man’s outfit. Different type of watches for different type of occasions, that’s what I’ve learned from my fashionable mom. Well I never grew tired of wearing different watches even now. I find it amusing really. I still have my Seiko Diver’s watch working well after 5 years.. Brian of buy scrap platinum.